The Chris Wick Gallery is pleased to present an exhibition of new works featuring local artists. The “Zeitgeist” will run on Friday, March 1, from 5:00 to 8:00 p.m.
Eleven gallery artists will be featured in the show: Jillian Abernathy - Watercolorist, Edsel Campbell - B/W Photography, Laurie & Bill James - Metal/Woodworking, Tracy Jensen - Nature/Landscape Photography , Celeste Johnson - Conceptual Artist, Jessica Jones - Surreal Painter, Teri McGrath - Intuitive Painter, Simon Graves - Portrait/Nature/Figure painter, Roderick Neswick - Sculpture, Rachel Joy Osterman - Digital painter, Christina Wickstein - abstract Painter, and Corey Youngren - Pyrograph Wood Painter. Many of the works explore unconventional techniques under the “Zeitgeist” Exhibition. “Zeitgeist” means ​the defining spirit or mood of a particular period of history as shown by the ideas and beliefs of the time. 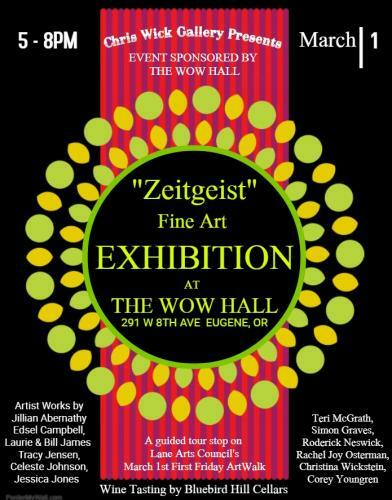 “Zeitgeist” will be open for one day only on March 1st, 2019 at the WOW HALL. Chris Wick Gallery is the newest addition to the Monroe community and is the inspiration of local Monroe area resident Christina Wickstein. The pop up gallery exhibits emerging and established artists creating contemporary works on paper, paintings, ceramics, sculptures and more. The mission of the Chris Wick Gallery is to bridge various local artist communities and provide its artists greater exposure to Monroe, and Oregon, in general.